Looking for a healthy and quick snack? 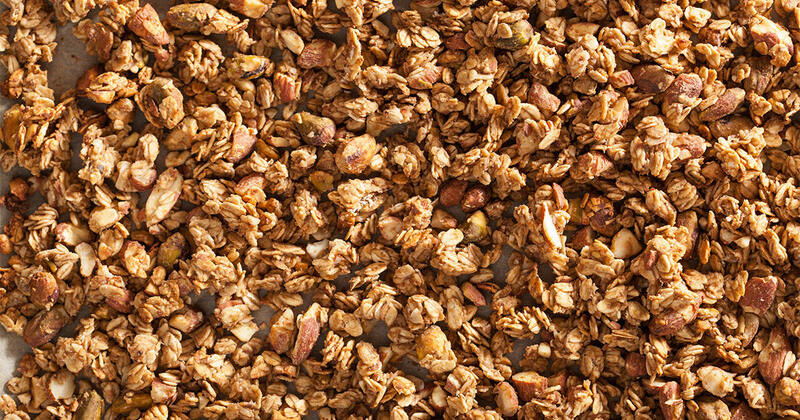 This is out our favorite Pumpkin Spice Granola Recipe adapted from Annie's Noms Blog. Preheat the oven to 325F and line a baking tray with a silicone mat/grease proof paper. Place oats, sugar, spices and vanilla extract into a large bowl and stir until the oats are coated in the spices. Add in oil, maple syrup and pumpkin purée and mix until well combined and the purée and oil has coated everything. Tip onto your prepared baking tray and spread out evenly. Don't worry too much about flattening into one layer as you want some clumps of oats, but just loosely spread it out to fill the baking tray. Once the mixture has darkened and is crisp to the touch, leave to cool completely before storing in an airtight container, at room temperature. Serve with milk, yogurt or just snack on it by the handful! Pumpkin Spice Granola will keep for one week.